The new Carnegie Velociraptor figure. I'm pretty slack when it comes to keeping up with my Twitter account, but if one thing can get me to break my one post per month general rule, it's "somebody is wrong on the Internet!" Or, in this case, "somebody made an inaccurate dinosaur model under the auspices of museum-approved accuracy!" Let me preface this post with a few disclaimers. One, I have no problem with people making dinosaur art however they like. But I feel it's very important to draw a distinction between dinosaur art in general and paleoart. Creating a drawing, painting, or sculpture under the guise of paleoart implies that some degree of research went into the piece. When evaluating paleoart, critics are completely entitled to demand as rigorous an approach to accuracy as the evidence allows. Of course, speculation must be included to some degree, but the baseline expectation is always that basic facts and plausible inference will be taken into consideration. Dinosaur art is a for of pop art, a purely artistic expression. Paleoart is a representation of a scientific hypothesis about the life appearance and behavior of an extinct organism. This recent Twitter kerfuffle was due specifically to the debut of a new dinosaur figure in the Carnegie Collection produced by Safari Ltd. I've been a big fan of the Carnegie figures (and the sometimes nicer quality Wild Safari sister series) since I was a wee lad buying my first Carnegie Pteranodon in a little hobby shop for about $2, and pining over their massive Brachiosaurus. Carnegie figures have obvious appeal for scientifically-minded young dinosaur fans. First, most of them are made with a consistent scale (usually 1:40), so when you line them all up you can see how big each animal was compared to one another. Second, they are marketed as having the highest level of scientific authority: the Carnegie Museum stamp and assurances that hey are approved by actual paleontologists gives them the weight of authority and accuracy not found in many other toy lines. Sure, many of the older figures, including my Pteranodon, are now sorely out of date, but this is due largely to the Science Marches On effect rather than a basic, original inaccuracy. However, like many paleoartists, the sculptors at Carnegie and related accuracy-minded/marketed toy lines seem to be having, well, let's say a little trouble adapting to the feathered revolution. Trained in the '80s and '90s drawing and sculpting Paulian, reptilian dinosaurs, it's been a steep learning curve for many of these artists to switch to bird-like, feathered dinosaurs, which many artists don't even realize requires a crash course in avian anatomy, rather than reptile or mammal anatomy, to get right. This is why expert consultants are so important in these projects--artists simply need help catching up with the latest research. Unfortunately, they're usually getting bad advice from "experts" who simply do not care. The newest entry in the Carnegie Collection is the old favorite Velociraptor. Carnegie had previously released a scaly Velociraptor, but like many of their other models, they have commendably updated it to try and reflect current science. Unfortunately, it seems they mainly achieved this by slapping feathers over the basic original model with no regard for the fact that feathers inherently change the entire presentation and outline of an animal. Unlike fur or "protofeathers", which just fluff up the outline of an animal, feathers are more like a mobile exoskeleton that re-defines the entire body. inference from living analogues, about the life appearance of Velociraptor. That being said, the Carnegie Velociraptor is not that bad overall and is very nicely sculpted, with an interesting and plausible color scheme. The feathers look fur-like, true, but this is not unprecedented among different lineages of large ground birds, and so is not unlikely in flightless protobirds (though they'd probably still be longer). The main problem here is the wing. Yes, wing. Like chickens and ostriches, protobirds possessed fully-fledged wings despite being flightless or nearly so, and retaining large claws on the fingers (yes, chickens, ostriches, and many other birds have hand claws--they are not some prehistoric protobird relic!). Specifically, the wings in the new Velociraptor figure are very small, with short feathers, and are present only on the forearm, not the hand, making them only half a wing--literally, since they're issuing the primary feathers. We do not have direct evidence of primaries, but we have never found a single example of a maniraptoran that has secondaries but not primaries, and so it should be assumed they were there by default. As for secondaries, we have direct evidence in the form of quill knobs for this species. Quill knobs are not found in all feathered animals, let alone all flying birds, and seem to be associated with strong attachment either due to high-stresses during flight or other flapping behavior and/or especially large/long individual feathers. 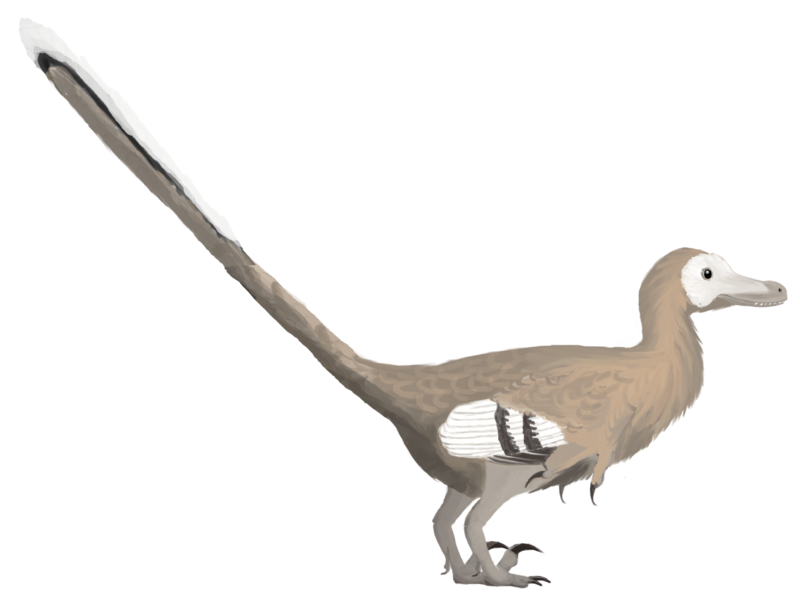 Long story short: Not only did Velociraptor have wings, it probably had larger wings than many other dromaeosaurids. AFAIK not even Microraptor and Archaeopteryx had quill knobs to support their wings. The new Carnegie figure, on the other hand, barely has wings at all. What went wrong? Some insight can be gained by a recent series of incidents involving sculptor Dan LoRusso on the message board of the Dinosaur Toy Blog. LoRusso Is an amazing artist and is responsible for some of my all-time favorite dinosaur figures released in the Boston Museum of Science Collection by Battat (now being re-released with updates and new figures under the Terra brand). Collectors were understandably excited about the fact that the Battat series was coming back after nearly two decades, though the excitement was dampened a little by some obvious accuracy issues in the new figures, specifically when it came to the feathered species (or species that should have been feathered). LoRusso was criticized online for producing a very well done but very inaccurate therizinosaur figure which completely lacked feathers. It would have fit right in with the excellent quality and Paulian style of the original series... back in 1994. But in 2014, when we have incontrovertible proof that therizinosaurs were not only feathered but that at least smaller species were very densely feathered, it is simply bizarre to see a featherless figure in a line that is being marketed as scientifically accurate. LoRusso stated that his consultants told him larger therizinosaurs would have been featherless. It's not LoRusso's fault that he somehow was able to sculpt a bald maniraptoran in the year 2013. Somebody who did not know what they were talking about and claiming to be an expert in paleoart just because they work in the related field of paleontology told him to do it, and he very reasonably believed them because they were an "expert", though obviously they had misrepresented themselves. And there's the biggest problem and probably the answer to the question of what is going on with these strange and obvious inaccuracies. Paleoart consultants for major projects tend to be, often but not always, simply terrible. They seem not to know what they are talking about. Not only that, but second-hand reports suggest that they often simply do not care. Seriously: When asked about blatant inaccuracies creeping into paleoart-based projects like toys or books or even press releases, at least one anonymous paid paleontological consultant stated that they don't care what dinosaurs looked like in life, and so would presumably rubber-stamp any abomination that came across their desk. @mpmartyniuk You know I've spoken to working palaeontologists who even say that they >don't care< about depicting life appearance? and lack of a clawed third finger. EXCEPT on the second finger where they belong, and the incorrect number of fingers. The wings/arms of this figure are wrong in just about every single way possible, and these are not minor details. Yet it's marketed as accurate and "paleontologist approved" in a series bearing the name of a major scientific institution! It's not fair to ask all working paleontologists to know or care how their research into fossils translates into life appearance. Matching osteological and behavioral correlates with the structure and anatomy of living analogues could almost be considered a distinct field separate from actual paleontology. This is something paleoartists can and do think about and research constantly, but would almost never need to enter into the research when describing fossils. There's really no reason for working paleontologists to keep up to date with developments and research that go into paleoart. The solution? Don't ask these paleontologists to consult! Just because someone is a paleontologist does not make them an expert on the life appearance of any given species of prehistoric organism. The examples cited above were, allegedly, all approved by "expert" consultants. This simply proves the consultants that are being employed are utterly failing at their job. I hate to say it, but there are legions of paleoartists and other dinosaur fans online who jump at the chance to criticize and nitpick and otherwise consult on these things for free. It's just that by the time the product is released, it's too late to do anything about inaccuracies. If companies that use paleoart would simply post concept art beforehand on, say, Facebook, they could probably get much better advice for free. Or, preferably, they could employ actual paleoartists as experts, hopefully artists who specialize in researching the life appearance of a given subject group of organisms. Darren Naish, Mark Witton, and John Conway recently published an article on the (shameful) state of paleoart as used in professional and commercial contexts. Companies like Safari Ltd. would do well to listen to their advice.